That’s how much of the University of Oregon’s $120 million in athletics revenue comes from its men’s basketball team. The squad will pull in about $13.3 million this season, according to projections from the school. Compare that with the $79.6 million that it gets from football, a sign that even top-notch basketball programs are dwarfed by their gridiron counterparts. Broken down by category, the school’s sports programs get their biggest revenue slice from Pac-12 and NCAA payouts ($35 million). The next biggest buckets are donations ($31.4 million), ticket sales ($24.1 million) and sponsorship/licensing ($18.1 million). 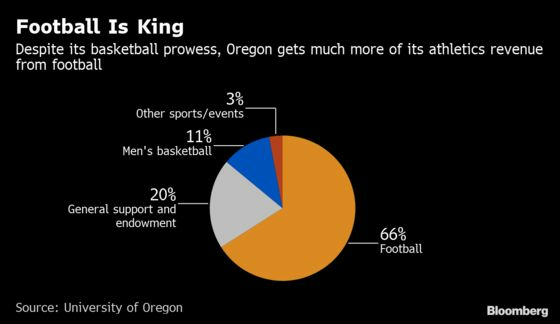 Oregon is one of roughly 20 athletic departments that balances its budget each year, meaning it gets no money from student fees and no direct support from the academic side of the institution. The only double-digit seed remaining in the NCAA tournament, the school faces top seed Virginia on Thursday night for a spot in the Elite Eight.